My version of Lincoln's "Mount Puckmore"
About four years ago on the Yahoo.com NHL "Puck Daddy" blog, they did a feature for each NHL team called "Mount Puckmore." In this fantastic summer project, the folks at Puck Daddy picked four defining faces of each NHL franchise. At the time, I thought about doing something similar for the Lincoln Stars, but I never got around to doing it. With 40+ days until the home opener, I figured now would be a good time to resurrect this article. I gives us something to talk about before the preseason schedule begins in about one month. We all know the four iconic faces on Mount Rushmore: George Washington, Thomas Jefferson, Teddy Roosevelt, and Abraham Lincoln. They define our country's storied history. So let's take that same thought and look at four defining faces which encapsulate what the Lincoln Stars are about. One topic that is frequently brought up with these team Mount Puckmore articles is, do you only count what the player/coach did with the team? Or do you also consider what they did afterwards? At the junior hockey level, players move on to successful college and (hopefully) pro careers. I think it's fair to take into consideration what they've done after they've left Lincoln, and not focus only on what they've done with the Stars. Just my opinion. I've included about 12 players/coaches below that I think should be considered. You are welcome to add your own if you wish. If there is a player/coach/executive you think is worthy, let us know! You can leave a comment below, or email me at lincolnstarshockey@gmail.com. Comments are wide open, so you do not need to register to leave a comment. Steve Johnson: The "Godfather" of Lincoln Stars hockey. Coached the 1996-97 expansion Lincoln Stars to a 40-13-1 record and won a Clark Cup that season (first USHL expansion team to ever win the Clark Cup). Steve was named the USHL coach of the year in 1996 (with Fargo-Moorhead), 2000 and 2001. Steve was also named USHL general manager of the year for 2000-01. He led the Stars to a second Clark Cup championship in 2003. Johnson won three Anderson Cups (USHL regular-season champion) with Lincoln in 2000, 2001 and 2003. He won 30+ regular season games nine times with Lincoln. His overall regular season record with the Stars is 406-188-47, with a playoff record of 49-36. 'Nuff said. Derek Reynolds: The heart and soul of the 1996-97 Lincoln Stars. Reynolds was a Tasmanian devil on the expansion, Clark Cup winning team. In 50 regular season games for the Stars that magical season, Reynolds scored 62 points (21g, 42a) and added 265 PIM's. In 14 playoff games, Reynolds scored 20 points (8g, 12a) in route to the Clark Cup. As Stars radio announcer Mike Melbye said on Twitter, "In the spring of 1997, Reynolds could have run for mayor of Lincoln and won." Former Stars forward Ted Suihkonen said on Twitter that Reynolds was "Mr. Everything" during the championship 1996-97 season. Reynolds played three seasons at the University of Nebraska-Omaha before spending five years in the pros. He returned to Lincoln in 2004 and spent two years in Lincoln as an assistant coach for the Stars. Josh Langfeld: Along with Derek Reynolds, led the Lincoln Stars to a Clark Cup championship in the team's first season in the USHL. Langfeld scored an impressive 58 points (35g, 23a) in 38 regular season games during 1996-97, along with 100 PIM's. Langfeld added 21 points in 14 playoff games that season. Although he only played one season in Lincoln, Josh certainly left his mark. In 1998 for the University of Michigan, Josh scored the championship winning OT goal to beat Boston College and give the Wolverines a national championship. Langfeld is the first Lincoln Stars player to be drafted in the NHL, as he was selected by the Ottawa Senators in the 1997 NHL draft. He's also the first former Stars player to play in the NHL. Grant Potulny: Played two season for the Stars (1998-2000) where he scored 73 points in 102 regular season games, including 161 PIM's. Like Josh Langfeld, Grant was a prototype power forward who used his size to dominate games. After his time in Lincoln, Grant went on to play for the University of Minnesota, where he was a three-year captain for the Gophers. In 2002 for the University of Minnesota, Grant scored the championship winning OT goal to beat the University of Maine and give the Gophers a national championship. Grant has been an assistant coach for the Gophers for the past five seasons. Nick Fouts: Tough as nails defenseman who played 137 games in a Lincoln Stars uniform from 1998-2001. The native of Lake Stevens, WA accumulated 31 points and 573 PIM's in those 137 games. Fouts was team captain on the 2000-01 Anderson Cup winning Lincoln Stars team. After four years at New England College, and a brief pro career, Fouts returned to Lincoln as an assistant coach from 2007-2010. Fouts was a very popular player among the fans. He wasn't a big guy, but he definitely played big. Heart and soul type of player. You still see #2 Fouts jerseys at the IceBox to this day. Chris Fournier: Fournier holds many franchise records for the Stars, including games played (217), goals scored in a career (79-tied with John Snowden), career assists (159), and career points (238). Chris played four seasons for the Stars from 1997-2001. The diminutive native of Anchorage, AK scored 83 points in 55 games during the 2000-01 season, which was a franchise record before it was smashed by Kevin Roy (104) in 2011-12. Fournier was named USHL Forward of the Year, and USHL Player of the Year for the 2000-01 season. Another extremely popular player among the fans. Ryan Potulny: Younger brother of Grant Potulny. Scored 135 points in 114 regular season games for the Stars over the course of two seasons (2001-03). In 2002-03, Ryan led the Stars in regular season scoring (78 points in 54 games), ahead of players such as David Backes, Danny Irmen, and John Snowden. Ryan led the Stars in playoff scoring in 2002-03 (17 points in 10 games) in route to the Clark Cup. Ryan was named USHL Forward of the Year, and USHL Player of the Year for the 2002-03 season. After three productive seasons at the University of Minnesota, Ryan embarked on a lengthy pro career. Potulny has scored 49 points in 126 NHL games. Jean-Philippe Lamoureux: "Phil" accumulated a record of 64-38-8 over the course of three seasons (2001-04) for the Stars, including a total of 13 shutouts. Stopped 70 of 72 shots in the last two games of the 2003 USHL Clark Cup Finals against the River City Lancers to earn two big wins and clinch the Clark Cup for the Stars (the last time they have won the Clark). Phil was named the USHL Goaltender of the Year for the 2003-04 season. Phil played in 115 games for the Lincoln Stars, the most of any goaltender who as suited up for the organization. After four seasons at the University of North Dakota, Phil has bounced around in minor pro hockey, mostly with AHL and ECHL teams. The last three seasons he has played pro hockey in Austria. David Backes: Arguably the most famous alumni of the Lincoln Stars. In 87 games over the course of two seasons (2001-2003) for the Stars, Backes racked up 90 points (39g, 51a) to go along with 180 penalty minutes. David was a key part of the 2002-03 Lincoln Stars team that won both the Anderson and Clark Cups. Backes scored the eventual game-winning goal in the deciding Game 5 of the 2003 USHL Clark Cup Finals against the River City (Omaha) Lancers. After three successful seasons at the University of Minnesota-Mankato, Backes entered the NHL and has been a mainstay for the St. Louis Blues since. In September of 2011, Backes became the 20th captain in the history of the St. Louis Blues. David is a two-time Olympian and won a silver medal with Team USA in the 2010 Winter Olympics. Jared Boll: Definitely a fan favorite during his time with the Stars. In 2003-04, Boll arrived in Lincoln and scored 14 points (6g, 8a) and racked up 176 penalty minutes in 57 games played. The next season, in 2004-05, Boll exploded with 47 points (23g, 24a) and a whopping 294 penalty minutes (team record for most in a season) in 59 games played. After two seasons in Lincoln, Jared moved on to play two additional seasons of junior hockey, this time in the OHL with the Plymouth Whalers. The past seven seasons, Jared has played a total of 416 NHL games with the Columbus Blue Jackets. Since the start of the 2012-13 season, Boll has been an alternate captain for the Blue Jackets. At all levels played, Jared was definitely a guy who was fearless and was never afraid to drop the mitts. Brandon Bollig: Arguably one of the most popular players among the fans of the Lincoln Stars. In 173 regular season games for the Stars, Bollig scored 73 points (37g, 36a) and racked up an incredible 593 penalty minutes (franchise record for most PIM's in a career). During his heyday with the Lincoln Stars, Bollig was known to be one of the toughest heavyweights in the league. Lincoln's rough and tumble style of hockey fit Bollig's style very well. After spending two seasons playing college hockey at St. Lawrence University, Bollig signed with the NHL's Chicago Blackhawks. At the conclusion of the 2012-13 NHL season, Bollig became the first alumni of the Lincoln Stars to win the Stanley Cup when the Chicago Blackhawks beat the Boston Bruins in the finals. Kevin Roy: Kevin only played one season for the Lincoln Stars, but during that 2011-12 campaign, Roy crushed just about every Tier-1 USHL offensive record that previously existed. In 59 games for the Stars, Roy scored a whopping 104 points (54g, 50). In 8 playoff games that season, Kevin scored 10 points (7g, 3a). His regular season point total was the most in the USHL Tier 1 era (2002-present) and the most by a player in over 20 years. Kevin was also the first player in the USHL Tier-1 history to score 50 goals in a season. As he smashed USHL records, he also smashed Lincoln Stars team records including most points and most goals in a season. At the conclusion of the 2001-12 season, Kevin was named the USHL Forward of the Year and USHL Player of the Year. Kevin was later drafted by the Anaheim Ducks in the 4th round of the 2012 NHL Entry Draft. All of the players noted above, save for Kevin Roy, have been inducted into the organization's "Stars of Fame." Of all the players/coaches listed above, the only lock (in my opinion) is Steve Johnson. You can't talk about the history of the Lincoln Stars and not start the conversation with Steve Johnson. He put the Stars on the map. As I stated above, he is the godfather of Lincoln Stars hockey. There should be zero debate on if he should be one of the four faces. My four faces? Well, this was a VERY tough decision for me. I was a season-ticket holder from 1996-99, so I was there to witness some great early teams and players. I moved to Seattle in 2000, and lived there until 2006. So I missed players like Backes, Fournier, Boll, Lamoreaux, and many others. Since the 2006-07 season, I've been a season-ticket holder once again. So I've seen a combination of both old and new. 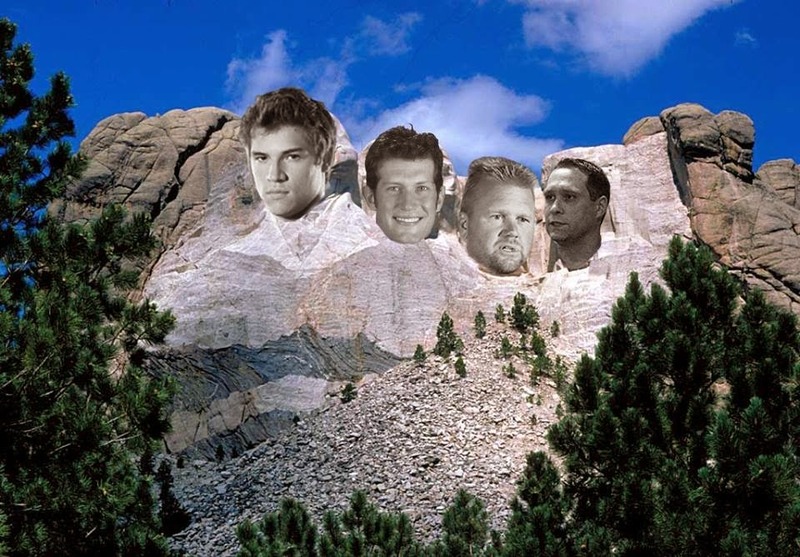 Anyway, the four faces on my "Mount Puckmore" would be Steve Johnson, Derek Reynolds, David Backes, and Kevin Roy. Derek Reynolds won the hearts of Stars fans instantly with his style of play. He put the 1996-97 team on his back and led them to a league championship. A lot of the new fans really missed out on one heck of a player. I'm not sure the Stars become the first USHL expansion team to win the Clark Cup if it wasn't for Reynolds. I never saw Backes play in a Stars uniform, but his accomplishments with the Lincoln Stars, the St. Louis Blues, and internationally (Olympics), are hard to ignore. If someone were to ask you who the most famous alumni of the Lincoln Stars was, you'd likely say David Backes. I may catch some flak for including Kevin Roy, but I feel that he is more than deserving. In one season in Lincoln, Kevin did things that have never been done at the USHL Tier-1 level. He smashed just about every offensive record for the Stars, and many for the USHL. Countless times that season, Roy did things that left me amazed and shaking my head. He's a once in a lifetime talent that we may never ever see again at the USHL level, let alone in Lincoln. Nick Fouts and Chris Fournier were two names that were hard for me not to include in my list of four faces. Fouts was my favorite player back in the day (still is), and I occasionally rock a #2 Fouts Stars jersey at the IceBox. Fournier has worn the Stars jersey in more games than any other player, and before Kevin Roy, held the majority of the team's offensive records. I only listed 12 above, but you could argue that there are others who should be included. Players such as Danny Irmen, John Snowden, Jason Gregoire, David Reekie, and Paul LaDue. Okay, now I want to here from you, the reader. Who are your four faces for Lincoln's Mount Puckmore? Please leave a comment below. Like I said above, you do not need to register to leave a comment. You can be anonymous, if you wish. Great topic Yeti. I'm going with Steve, Kevin Roy, David Backes and Phil Lamoureux. If I had to have a D on it, I would go with Paul Ladue. I know Nick Fouts was more popular, but I don't know that we've had as complete of a D-man as Paul. It is so tough to not put David Reekie up there. After being cast off by Everett in 07 he could have come here and gone through the motions. Instead he embraced what it meant to be member of the Stars family (Just ask Shane Madalora of Omaha) and dominated. Had he been able to play a second year in Lincoln, I don't know that there would be much discussion as to if he belonged on Mt. Puckmore. I had originally put Jared Boll on my list, but replaced him with Phil. In the first 17 games of the 04-05 season, Jared had 13 goals, 19 points and 110 PIMs. The goals and PIMs lead the league at that point. Outside of Kevin Roy at any point in his season in Lincoln, I think that 17 game stretch by Boll was one of the best performances in franchise history. That said, Phil was, and still is, a freak of nature. It’s tough to leave off a guy who is one of the most popular players ever to come through Lincoln. And who also happens to be the only former Star with his name on the Stanley Cup. Brandon Bollig is another just miss for me. Not sure I need to explain why either. Best part about Brandon is probably the way he conducts himself off the ice. Pure genuine class. Let's go Stars Nation, who do you have on your Lincoln Stars Mt. Puckmore? And who didn't quite make it? g. I think if we are just going by just time in stars jerseys I'd put Steve, Bochenski, Lamoureux and Roy. If I'm picking career I'd go with Steve, Backes, Grant Potulny and Nick Fohr. been meaning to reply to this but just got to it now. I'm probably a little biased since I wasn't around at the beginning of Stars hockey, and when we first became season ticket holders I didn't follow the players as closely. the first one is Steve Johnson - no question. he was a great coach and started with nothing and gave Lincoln something incredible. Nick Fouts - he was a great player and went on to be a great assistant coach. I wasn't around when he played, but saw his abilities as a leader and a coach. Brandon Bollig - tough player and a fan favorite. I know he racked up the penalty minutes, but he proved to be a great player, so I think that kind of balances him. Kevin Roy - though he was only here for one season, he was probably the most talented player the Stars have ever had. I feel he deserves to be recognized for this. I think we should focus on what the players did during their time in Lincoln, while also considering what they did afterwards. however, I think if most of their success came after their time in Lincoln, they should have spent a decent amount of time in Lincoln that would have attributed to their success. if they were only here for half season but ended up being an NHL star, they shouldn't be considered for this. however, if they weren't necessarily the best player here, but worked on building up their skills and went on to be successful, then maybe they could be considered. not sure if that really makes sense, haha, but it is difficult to say if we are talking about success as a Star, or success that came afterwards. Steve Johnson. I don't know which "Player" I would take off for Steve. Phil Lamourex was also an incredible player. We have been season ticket holders since the Stars franchise started. Derek and Josh were so incredible and got us going as Stars fans. Roy was such a pleasure to watch...wish he would've been here longer.